Greystoke residents enjoyed a week of activities during the Rainbow Express. 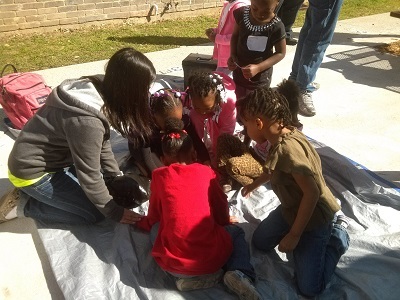 The youngest residents of TCHP's Beaty St. Apartments and Greystoke Apartments enjoyed a week of free activities during the 2013 Spring Break, courtesy of the Rainbow Express program managed by Mission Arlington. The volunteer-driven program includes snacks and learning activities and is offered during school vacations to children who may have limited access to enrichment or extra-curricular activities. During the 2013 spring break, Rainbow Express events were held in backyards across the Tarrant County area, with nearly 2,000 children and teens in attendance. Beaty St. and Greystoke are attractive, recently-updated rental properties offered at below-market rates for the benefit of low-to-moderate income renters. Enrichment activities for residents and the apartments' surrounding communities are offered whenever possible, as part of TCHP's commitment to neighborhood stabilization. Contact TCHP to learn more about rental property availability or if your organization has an interest in providing a TCHP community enrichment activitiy.